Few things hit the spot like a great salad on a hot August day. One of our favorite summer salads has already been perfected by not one, but two chefs in Great Barrington — Daire Rooney of the Mezze Restaurant Group and Steve Browning at Prairie Whale. 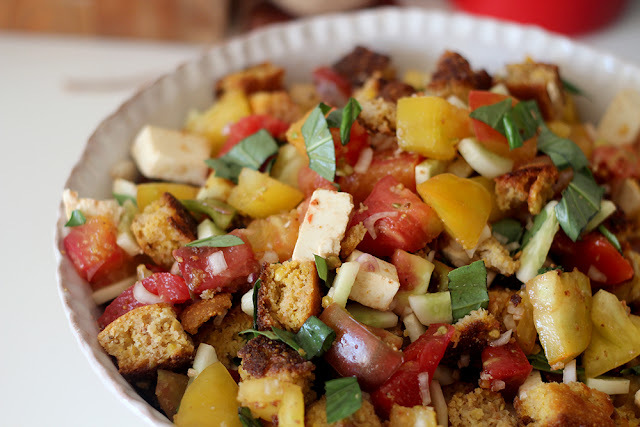 They have different approaches to the dish, but our reaction is always the same; when we see a panzanella salad on either of their menus, we just have to order it. But sometimes you just want to stay in and make your own, right? 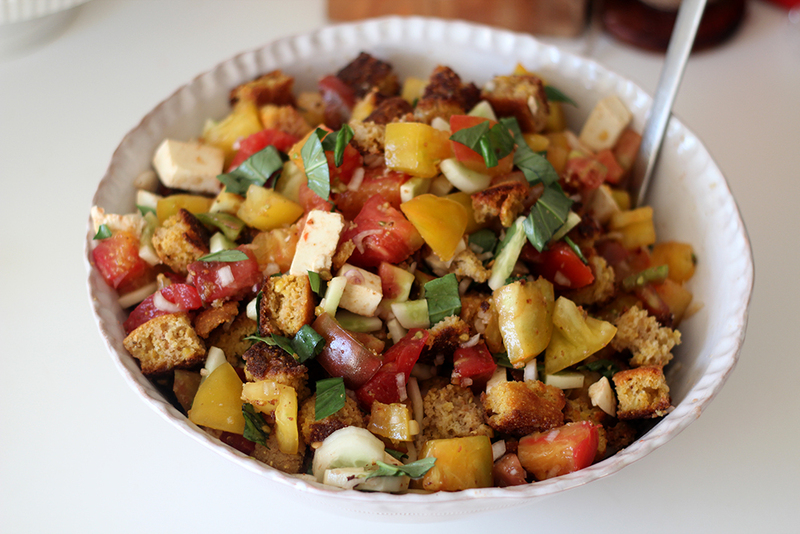 Luckily, with panzanella, you can’t go wrong. 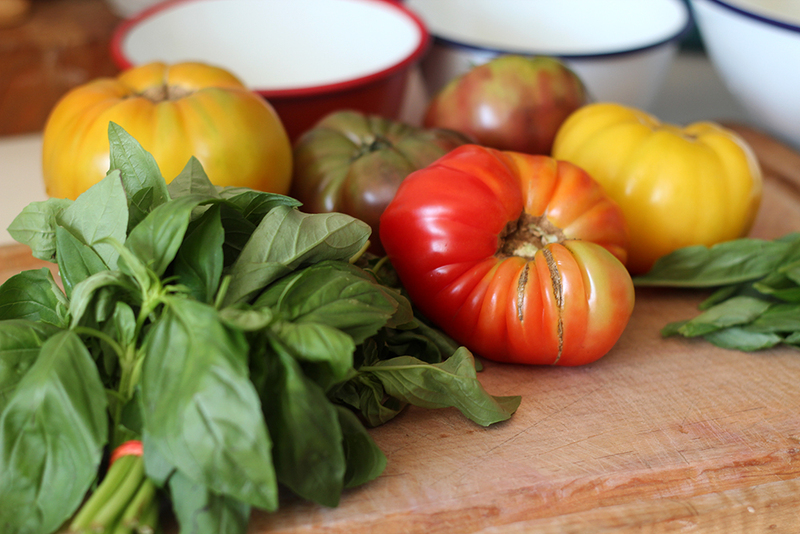 Just grab a few fresh ingredients, throw ‘em together and you’ve got a bright and satisfying classic summer side dish. This salad is simple, but also highly adaptable. Don’t like cucumbers? Leave them out. Have some beautiful sweet peppers? Toss them in. Whether you’re picnicking at Tanglewood, dropping by a summer potluck, or just feeling lazy, this salad promises to deliver. 1. 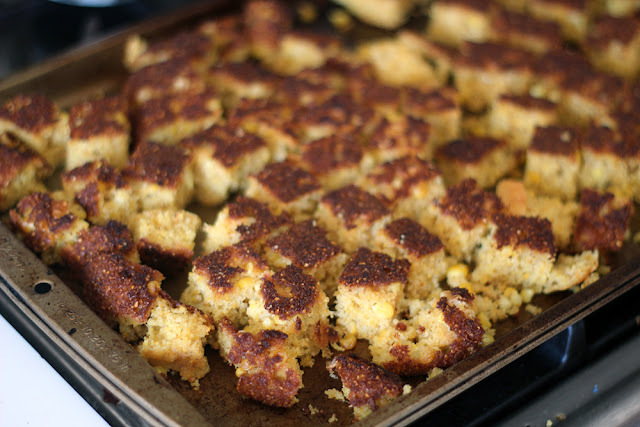 Lay the cornbread cubes out on a baking sheet and drizzle about 3 tablespoons of olive oil on top. Toss until the pieces are generally covered, and season lightly with salt and pepper. Bake in a 400° oven for 10 minutes, gently stirring once or twice, until toasted. 2. In a large serving bowl, mix the tomatoes, onions or shallots, cucumbers, vinegar, remaining olive oil, and cheese. Add cornbread cubes and mozzarella, some salt and pepper, and toss. 3. Let sit for 20 minutes or so, then serve. Note: This recipe originally appeared on RuralIntelligence.com on August 10, 2015. It's been back-dated here on our blog so that it falls, seasonally, in the right place. The cake display equipment is more elegant and supposed to be put in a visible, strategic area in your store. More information on Contact - Starting a Bakery click here.